Cats are pretty awesome right? In fact, they're pretty purrfect. They're half the love of a dog, with way less commitment! You can leave your cat at home when you go out, and it could care less that you're not around. I'm pretty much a future cat lady. Yes- I set my ambitions and standards very high. Lucky for me, and all the other future cat ladies out there, cats are actually becoming quite the fashion trend! Our feline friends are rather cute, so it makes sense that anything with a cat on it officially qualifies as adorable! I mean come on, if Disney movies have taught me anything (aside from everything I know), it's that everybody wants to be a cat. Sleep and eat all day without judgement? Sign me up! Sigh- we are but mere humans. 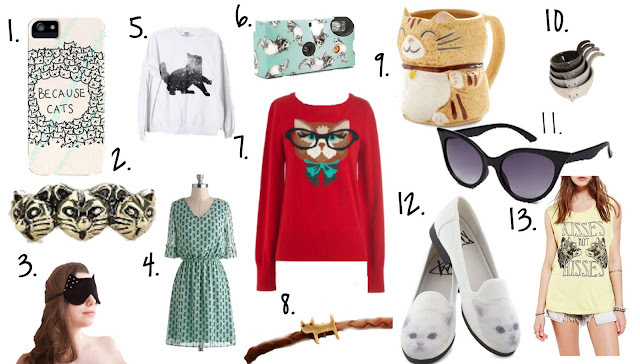 At least we can feel inspired and dip our paws into the feline lifestyle! Let me know what you think of these beautiful, pawsitively cute-as-a-kitten pieces! The cat's out of the bag, feline in IN.